Since the video signal has to be "digitized" before it can be "compressed," let's start with an explanation of how we make a digital picture. In the illustration above, the analog picture is electronically scanned and divided into small squares called picture elements, or "pixels." A typical picture would be divided into at least 300,000 of these pixels. Each pixel is then given a digital code which identifies its placement on the grid, its color and light intensity. For example, the digital code 1110011 might identify that particular pixel as four squares from the left hand edge, three squares up from the bottom, red in color and of medium brightness. When the picture has been completely scanned and converted into a digital format, it can then be represented by a huge string of ones and zeros. To give you an idea of the size of this string, consider this: it typically requires a series of at least eight digits (ones and zeros) to represent one pixel. A picture with 300,000 pixels would then require 2,400,000 digital bits, or 2.4 megabits to represent it. This is a lot of data, especially when you consider that television pictures are transmitted at a rate of 60 individual pictures or "frames" per second, this would require 140,000,000 digital bits for one second of video. 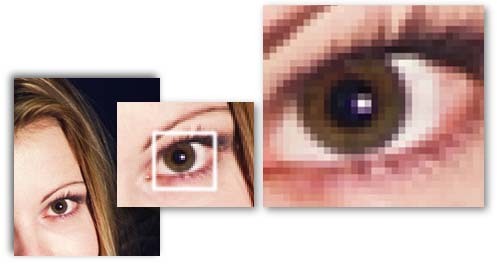 However, as the illustration above shows, much of the information from frame to frame is the same, so ..... by comparing the pixels in each frame and sending a simplified "ditto" command for the unchanged pixels, it was determined that it was possible to reduce the amount of data needed to send a top quality picture by as much as 90 percent with no loss in quality. What this would mean then is that up to 10 or more channels of compressed video could be sent in the same amount of bandwidth as normally required for only one channel. This technology was a major breakthrough for the cable industry. The effect of compression technology was to expand a cable network's channel capacity from say 60 channels to 600 channels, without rebuilding the network.